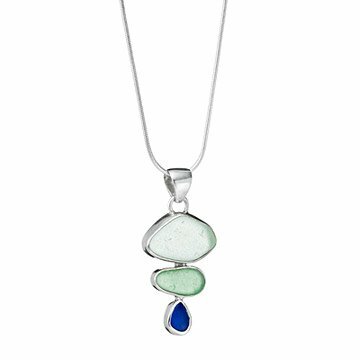 This ocean-inspired trio of sea glass is cradled in contrasting sterling silver. This ocean-inspired trio of sea glass is cradled in contrasting sterling silver. The top two pieces of beach-gathered glass feature open-back bezels that allow natural light to shine through and showcase the beautifully tumbled blues and greens. Suspended from an 18" sterling silver, snake style chain, this necklace is handmade by Carla Garro in Massachusetts. This necklace caught my eye immediately because we were married on Cape Cod and it so much reminded me of the Cape. My wife was extremely touched.